Life on the fast track finds Perry defending Walter Eastman, a racecar buff who is accused of murdering his European driver. One unusual fact about this episode: Della does not have a single line of dialogue! She is on screen a fair amount, but utters not a single word. The only time her voice is heard at all is when she chuckles along with everyone else at the fade-out. Note: This observation came from a televised episode; Della may indeed have had some lines edited out for commercial time. Submitted by Ed Zoerner, 4/1/2009. + No, Della speaks not a word in the DVD version either. Submitted by francis, 4/29/12. + Della can say more with a side-long glance or raised eyebrow than most women can say in an entire sentence! Submitted by DellaFan, 10/10/2013. Sightings: The Little Old Lady in a Hat hasn�t moved from her spot since the previous episode. You first see her as Hamilton Burger questions the coroner. As we cut to the gallery, she can be seen in the back row. Submitted by Kenmore, 9/13/2010. Uncredited Actors: The inconspicuous Bert Stevens appears in the courtroom gallery, looking rather puzzled.Submitted by gracep, 12/2/2010. A cup from the Curious Coffee Set is used to serve coffee to Ms Eastman to calm her nerves. jfh 10Oct2017. Anomaly: Although the race-car engine designer is a professor and credited as Dr. Mooney, Walter Eastman addresses him as Mr. Mooney, and the lieutenant and others refer to him that way, too. Submitted by gracep, 12/2/2010. Location: Since the show likes locations to pull double duty, I suspect the Tudor house 3 minutes into this episode (probably in Hancock Park) is also the Tudor 3 minutes into �TCOT Unwelcome Bride.� Also 6 minutes into �TCOT Unsuitable Uncle� it is supposed to be the house at 801 Stanhope Road. Submitted by Eric Cooper, 26 May 2011. Lt. Tragg (Ray Collins) appears only in the credits, but luckily Lt. Anderson (Wesley Lau) is on the job. Submitted by gracenote, 6/21/2011. A date is revealed at 27:26 when Mooney shows Perry (and us) a cheque he found on the floor of Danielli's room. The cheque has been ripped in two and the pieces taped back together. It is No 396, drawn on the WILSHIRE BANK LOS ANGELES, payable to Vincent Danielli and signed by Ralph Townley. It's dated October 10 19~~. There is actually a long horizontal slash on the cheque where the last two digits of the year should be. Submitted by Gary Woloski, 4/12 2012. CARS. (1) Erin Mooney's medium-color 1961 Buick Electra 225 Convertible, top down. (2) Kirby Evans' medium-color Jaguar XK140 DHC, top down. At 3:10 it's seen with its black top up & Lic No HKE 484, DHC = Drop Head Coupe = convertible. In the MeTV cable version that I saw, both shots of Kirby's car were edited out, as were most of the track shots of Car (3)! 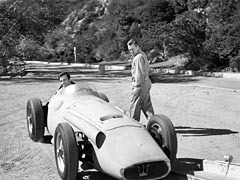 (3) light-color Maserati 250F, driver Vincent Danielli. More in Comments section, below. (4) Walter Eastman's light-color Jaguar XK150 FHC (FHC = Fixed Head Coupe). The Reg'n No on its European licence plate is blacked-out. For more on the XK140 & XK150 see Comments at Ep#121. (5) Kate Eastman's medium-color 1961 Chevrolet Impala 2-Door HardTop, License No VYZ 193. They certainly selected the right car for Kate; rumble-rumble-Screech!! (6) Dr Mooney's medium-color 1961 Mercury Meteor 800 4-Door HardTop, Lic No VJA 758. Mercury introduced Meteor as the low-end Mercury for the '61 model year to fill a gap left by the just-discontinued Edsel. "Monterey" (formerly the low-end Mercury) was promoted to high-end and the "Montclair" and "Park Lane" names were discarded. More here. (7) Police 1961 Ford Fairlane 4-Door Sedan with door-markings "POLICE 13410" & circular crest. (8) Perry 's black 1961 Ford Galaxie Sunliner, top down. Kirby, Walter & Perry are standing in front of it at "Horseshoe Turn" when Lt Anderson arrives (30:44). Cars 6, 7 & 8 are Ford products but Ford didn't get a mention in the end-credits (The "Automobiles supplied by. . ." credit started with Ep#126). The only background vehicle is the bicycle in the corner of Mooney's garage (25:21). This is the first bike that I've spotted in the Series! Added by Gary Woloski, 2/3/13. Tyre Troubles. When the Eastman XK150 first arrives at the track (01:45) it has whitewall tires on the right (passenger) side but when the camera angle reverses (2:32), we see blackwall tires on the left (driver) side. The right front tire of Kirby's XK140 is seen to be blackwall at 00:53 but at 3:10 the left front tire is whitewall. This is a production goof; you may ignore the anomaly since it's not meant to be part of the story. Just assume that all eight tires on the two Jags are whitewalls. I believe that what happened is one of the Jags, say the XK150, showed up for filming with four whitewalls and the other, the XK140, came with all blackwalls (D'oh!!). They decided that both cars were to appear to have whitewalls all round, so the left-side whitewalls from the XK150 were exchanged with the right-side blackwalls of the XK140 before shooting started. Unfortunately, the cross-dressing of the two cars was unintentionally caught on film. Note that at 24:18, when Perry meets Lt Anderson, who is crouched down at the right front wheel of the Eastman XK150, the tire is whitewall (as it should be). Added by Gary Woloski, 2/3/13. For me, there is a real plot hole here, because none of the events that unfold in this episode would have happened if Mrs. Eastman had simply divorced her husband. Her reasons (not wanting to sully his name) despite his philandering, just don�t hold water, especially if he has cut her off financially to boot! Submitted by gracep, 12/2/2010. + I thought that Kate and Walter were portrayed as a couple who deeply loved each other, with each character mystified as to why they were heading toward a divorce they truly didn't want. The anomaly nagged at me until . . . ALL WAS EXPLAINED in the last courtroom scene and the summing-up in Perry's office! I can't say any more without committing a "SPOILER"! Gracep, I think that you might have missed the last two scenes of the episode! Added by GaryW, 10/2/11. The Maserati 250F was a champion Formula 1 car of the mid-1950s. ID Clue #1 is the Trident motif in the (nose) radiator air intake, visible in photo at top of this page (adjust monitor brite/contrast if not seen). Other I.D. features are the (1) long sleeve-like "scoop" carburettor air intake on the Right exterior of the engine compartment, (2) wrap-around plexiglass windshield and (3) general body shape. "No less than 34" 250Fs were built 1954-58 both for private sale and for the Maserati Works F1 team. 250Fs had 40 wins during that period including many major F1 victories up to end '57, at which time it was eclipsed by its competition. Its classic beauty has always been appreciated and Stirling Moss said "It really was a very nice car to drive." This car in Episode #133 is probably an early 250F since only the initial production sported the front Trident badge and later cars had a sleeker, longer nose. The 250F has long external exhaust pipes on the Left Side, from the engine compartment back to the tail. These are not visible in the opening scene but are in the following track scenes, which may be absent from today's cable episodes. Of course, the car here has a (notional) "Rotary Engine" only for the story-line; if anyone actually were to open the hood on this episode's race-car, we would see a "conventional" 6-cylinder reciprocating-piston engine. Read more about the 250F at the Wikipedia and see some photos at Historic Racecars. See the badge here. Added by Gary Woloski, 9/22/11. + For the Crash Scene, the CBS/Paramount DVD contains, at 2:56, a one-second-long close shot of a Maserati 250F making a relatively benign, abrupt sideways roll and slide down a 2-meter (6 foot) embankment. The car in this very short shot has a large racing number "4" painted on the rear section, so it's not the same un-numbered Maserati 250F shown earlier with the Cast actors. Added by Gary Woloski, 3/15/12, revised 2/3/13. As the owner of two rotary-engine-powered cars over the years (a 1982 Mazda RX-7 and a 1993 Mazda twin-turbo RX-7, which I still own and drive), I couldn't believe my ears when I heard Walter Eastman tell Perry about the rotary engine in the race car ("no valves, no pistons, no cams..."). This episode was made only four years after the first prototype rotary ("Wankel") engine was built in Germany, and three years before the first production rotary-powered car was offered for sale! Someone on the Perry Mason production staff must have been a car or racing buff; I would think very few people would have heard of the rotary engine in 1961. Sadly, due to high emissions, poor gas mileage, and reliability problems (I'm on my third engine in my '93 RX-7), the rotary engine has never fulfilled its promise. Submitted by 65tosspowertrap, 10/10/2013. "Piston engine goes boing, boing, boing, but a Mazda goes hmmmmmm." I've had that advert phrase stuck in my brain for decades. '65tosspowertrap's' comment couldn't be more pertinent - I just read that Mazda has once again put off reintroducing a rotary powered car. Their most recent model with their 'Renesis' engine was dropped a year or so ago. The Ro80, one of the first rotary cars, didn't do all that well, finally being dropped and the company being bought by Audi. Oddly, in Chicago, where I live, there was a service station on the near South Side (down the street from Home Run Inn pizza, if you know what I'm talking about) that had a Ro80 on it's lot for several years - station and car are long gone now! Submitted by MikeReese, 12/6/2013. Is it my imagination or do actors Jess Barker, who plays Walter Eastman in this episode, and Hugh Marlowe, who appears in numerous other Mason episodes, have incredibly similar voices? Submitted by BobH, 14 January 2016. One of the more unusual courtroom confession scenes, with an ample slice of ham, as the guilty party changes abruptly from a seemingly benign figure into a grinning psychotic manipulator obsessed with his own cleverness. Submitted by BobH, 28 December 2015. +For his performance in this critical scene, the actor becomes eligible for the 1961-62 season's Robert H. Harris Award. Unfortunately, Mr. Harris himself couldn't give him a run for his money, not having made even one guest appearance during the entire season. Submitted by BobH, 21 January 2017. Both cars must still be jacked up. The knock-off spinners, which are screwed on very tightly, must be whacked off with a one-kilogram (2.2 lb) copper-headed hammer. . . and whacked back on after the switch. Noisy! You'll get the idea here watching the chap checking that his knock-off spinners are tight enough. Nevertheless, this is a great plot device because many viewers would have associated knock-offs with quick wheel changes (note the lifting dolly). The knock-offs on Cars 2, 3 & 4 give a visible clue for the TV-Dinner sleuths. XK120, 140 and 150 all had the same wheel and tyre size (6.00x16). Today, new replacement wire-wheels for XK120, 140 and 150 are identical (Part no 202162 & others). Whether or not Kirby's switch between models was a "Not Recommended" practice in 1961 is a question for an XK historian (XK120 & 140 had drum brakes but the heavier XK150 had quicker-stopping disc brakes). But Kirby was a crazy psychopath, so that doesn't matter either. For curious mechanics, the hubs for XK120 & 140 (both with drum brakes) are identical and shown here. The XK150 hub (disc brakes) is here. Note the splines on the stub shafts which must match the splines on the inside of the wheels. The spinner screws onto the outboard threaded segment of the hub and the whole assembly rotates with the spoked road-wheel and brake drum or brake disc to which the hub is bolted. The appearance of conspicuous wire wheels on three cars in the episode was a deliberate plot gimmick that was intended to provide a clue. The complete version on DVD gives us the opportunity to spot the clue whereas today's cable-network versions with Kirby's car edited-out don't - It's Criminal! Submitted by Gary Woloski 3/14/12, revised 2/4/13.